It brought people together from all over the world whose businesses and working lives have become a manifestation of an inward walk of faith. 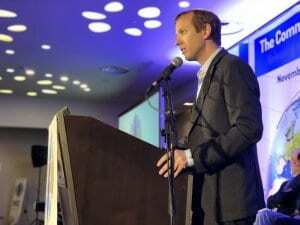 Timo Plutschinski of the WEA Business Coalition, spoke about business as a way to express God’s characteristics and Biblical principles such as accountability, trust, forgiveness for mistakes, excellence, responsibility, goodness and love. Business, he posed, can act to expand the covenant between God and the Jewish people, but as business is all about relationships, this aim cannot be reached alone. Knesset Member Robert Ilatov similarly commented on the intertwined destiny of the Jewish and Christian peoples, maintaining that when the world attempts to rewrite history, declare facts that never existed, promote the racist labeling of products made in Judea and Samaria and claim that the Jewish people have no connection to their holy sites, so too are they undermining the Christian faith – and all foundations of monotheistic religions for that matter. Sturesson further explained that Jews and Christians “have a common history and dialogue, and most importantly, a common future.” He thus called on Christians to stand up for their Jewish roots and Judeo-Christian values by “promoting business between Christians and Jews” and “standing together” in strategic partnerships. One of the conference participants doing just that, Kerstin Ekholm from Finland, has been to Israel more than 50 times in the past 30 years. After becoming inspired by the ICCC conference in previous years, she started her import company, Tabita Products, to support Israel and “spread Israel’s light.” The company imports cosmetics, shampoos and anointing oil from Israel to Finland. Dedicating her life to this cause, Ekholm previously raised money in her Swedish-speaking Pentecostal church called “Sion” to bring a whole flight of immigrants from Russia to Israel. 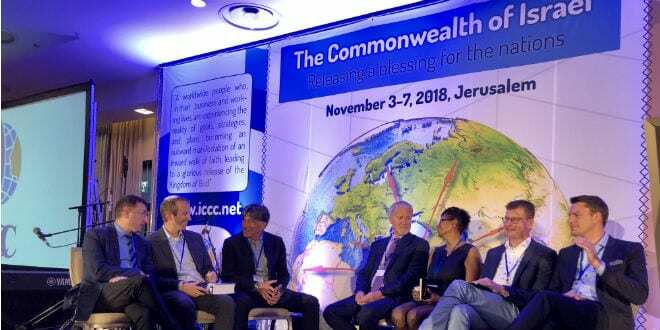 She and her husband began to bring others from their church with them to Israel as well, and Ekholm continues to participate in the ICCC conference, calling it a “prophetic organization,” and looking forward every year to meeting like-minded business people who stand with Israel. So too was this one of the conclusions related by Rabbi Tuly Weisz, Director of Israel365 and publisher of The Israel Bible and Breaking Israel News, in his address to the conference. Weisz associated three lessons from the story of Abraham to Abraham’s great descendants, the people of Israel as manifested through the state of Israel.